Quick-drying Enhanced Plaster of Paris bandages are manufactured professionally, which are widely used in medical field, such as the facture fixation, shape some people also use it to create model etc. The product is easy to be used and able to be solid as quick as 3-5 minutes with highly soft-feeling, and become harder and harder as time goes, and never get damp, never get soft. 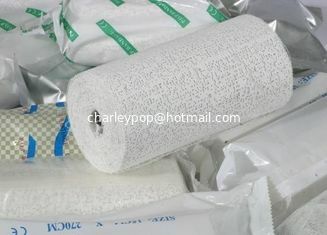 basic cloth is gauze 40's (brilliant, clean), 100% cotton, warp: 120+/-3/10cm, weft: 80+/-2/10cm.